"Natural birth might be a great choice for you, but it isn't for everybody. I was perfectly happy with my birth involving XYZ interventions, and so are lots of women. It is about choices." I have to disagree. This isn't just about "choices." Natural birth is not just a great choice for women like me. It is almost always the best choice for the mother and baby. Yes- I just said that. Natural birth is usually the best choice for mother and baby. And, I can prove it. There is an interesting aspect to a lot of natural birth discussions these days. I notice many people wanting so much not to be judgmental that they talk about natural birth like it is all about the mother's choice. If mama feels like she needs an epidural, then that is her choice. If mama is fearful of labor for whatever reason, she has the choice to schedule an abdominal surgery. If she is tired of being pregnant, she can choose an induction. Basically it is up to her. There is a lot of truth in this and I do think that women should be allowed to choose whatever they feel is best for them. Partly I think this because I don't want my choices taken away from me just because somebody disagrees or thinks that home birth or not vaccinating or whatever is unsafe. So, don't get me wrong, I am not advocating taking away a woman's right to choose how she births. I do however want to point out that there is much more to this topic than what is best for the mother or our ability to choose whatever we are comfy with. At some point we need to recognize though that birth doesn't just involve the well being of the mother. There are TWO people involved. The other one is silent and is the BABY. Is an epidural the best choice for the baby? Is a scheduled c-section the best choice for the baby? Is pitocin the best choice for the baby? Are we being honest with ourselves when we answer these questions, or are we just thinking about how the choice will make us feel? "Because of maternal and fetal risks, oxytocin must be administered with caution . It has been reported to cause fetal bradycardia, neonatal retinal hemorrhage, and neonatal jaundice, in addition to maternal effects . Fetal deaths due to various causes have reportedly been associated with the parenteral use of oxytocics for induction or augmentation of labor . Excessive dosage or administration of oxytocin to hypersensitive patients may cause uterine hypertonicity with spasm and tetanic contraction or uterine rupture . Abruptio placentae, impaired uterine blood flow, amniotic fluid embolism, and fetal trauma including cardiac arrhythmias, intracranial hemorrhage, and asphyxia may occur as a result ." Do you still think natural birth is all about the mother's "choice" and what she is comfortable with? Let's consider one of the drugs common in epidural anaesthesia, Bupivacaine. "Adverse reactions in the parturient, fetus, and neonate involve alterations of the central nervous system, peripheral vascular tone, and cardiac function. Maternal hypotension has resulted from regional anesthesia. Local anesthetics produce vasodilation by blocking sympathetic nerves. Elevating the patient’s legs and positioning her on her left side will help prevent decreases in blood pressure. The fetal heart rate also should be monitored continuously and electronic fetal monitoring is highly advisable. Epidural, caudal, or pudendal anesthesia may alter the forces of parturition through changes in uterine contractility or maternal expulsive efforts. Epidural anesthesia has been reported to prolong the second stage of labor by removing the parturient’s reflex urge to bear down or by interfering with motor function. The use of obstetrical anesthesia may increase the need for forceps assistance." You can read more about this drug here. Still think natural birth is all about what is best for the mother? Do you still think this is just about what mama wants? Do you believe that an increase in forceps delivery has no negative implications for the newborn? Let's take a look at some of the con's related to the elective c-section from a mainstream news source. "Cons: Possible pre-term delivery if due date calculation is inaccurate Rare: Possible infant injury when the doctor makes the uterine incision Risk of damage to the mother's bowels and/or bladder Increased maternal blood loss and risk of needing a transfusion Risk of complications from anesthesia (pneumonia, allergic reactions, low blood pressure) Slightly higher mortality rate for the mother Twice the risk of infant mortality Higher risk of infection and blood clots for the mother"
This article also mentions that more than half of the c-sections were done on an elective basis. You can read the study by the New England Journal of Medicine on their website, here. The idea that all cesareans are necessary is false. The access to natural birth is not just a feminist issue. It is not just a woman's issue. It is a human rights issue. Whatever we "want" is not necessarily best for our baby. In fact, it might not even be best for us. I realize that this argument goes both ways. Sometimes a c-section is best for mom and baby even when mama desperately wants a beautiful home birth. That is life and that is just how it goes. For my commenter who thinks that "natural birth might be great for me, but not everybody," well, I just think you are wrong. I truly believe that birth is intended to be a natural process. All common sense and logic tends to point in this direction. Most women throughout history have birthed without drugs and considering the current population of the earth, it looks like it was pretty safe. I am frankly just plain tired of hearing people talk about all this like it is just choices and what is right for you. 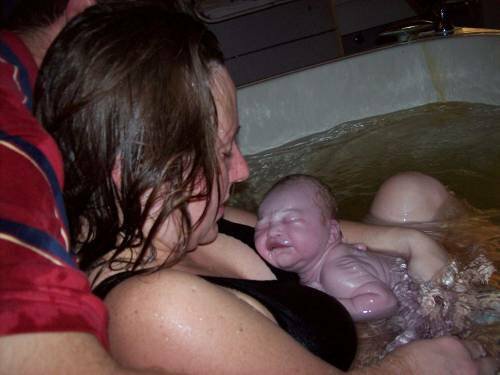 Natural birth really is better. It is safer. It is normal. It is how it should be. Drugs used unnecessarily cause problems for both the mother and baby. The drug manufacturers themselves will tell you this in their own package inserts. The negative effect of drugs on the baby is the same whether you "felt comfortable" with your choice or not. Good for you for being brave enough to tell the truth even though you might offend. sometimes the truth is too important to disguise just in case you upset someone. It's like the whole breastfeeding thing. I'm all for women's right to choose, but you can't try to say that formula is superior. it's not. I completely agree with this post, but playing devils advocate, what would you say to those people who would mention that before interventions etc, maternal and fetal mortality rate was higher? Nicola- I would say to them that it is my opinion that higher fetal (and maternal) death rates in an earlier era had more to do with nutrition (I believe that good nutrition can prevent many pregnancy and birth related problems) sanitation (we are able to have a much more sanitary experince now in the hospital since doctors started washing their hands after they touched dead folks and stopped spreading childbed fever)and the advent of some of the anti-hemmorage drugs (of which pitocin is of course one of). I also think that often women were attended by untrained midwives (which isn't a bad thing per se) but they may or may not have had any experience with CPR or various minor things that could go wrong but which today could be well handled even at home. I agree with many of your points, and love that you're blogging about something I'm passionate about. I find myself silently praying that my pregnant friends and loved-ones "see the light" but really have yet to say anything to anyone. Perhaps with time I can gain the strength. My angle to this issue: there is a norm of how human animals give birth and any interference with that norm is a deviation ergo: not as good as the norm. You cannot improve on the norm. There is only normal and non-normal and non-normal is a sub standard to the norm. Agreed, too, that higher maternal/fetal mortality was about bad hygiene, bad nutrition, inability to manage hemorrhage and lack of basic lifesaving skills, coupled with obstetric interferences to the process (lying on beds, drugging, etc). I'd be willing to bet that maternal/neonatal mortality was much lower before industrialization, especially outside of major city centres. Come industrialization and you have hordes of folks living in cities in squalor, giving birth in horrific medical facilities and the invention of obstetrics and their beginning to take over the normal cases as well as the outliers. You can choose anything, but the act of choosing doesn't make it healthier. I always thought the point of your blog, and others like it, is education. If that isn't your point, then by all means, carry on. But posts like this are going to alienate a lot of women who could really benefit from some straightforward information that isn't so heavy-handed. Anyone who reads your blog knows your views on this topic, and I'm guessing most respect you for those views. But when you get into high and mighty judging, you lose readers. I believe in a woman's right to choose what is right for her. No matter what. It's probably hard for you to see this, but you don't actually know what is best for other people. And santimonious, judgmental, preaching does nothing but alienate your audience. But hey, as long as you get to spout off you're happy, right? Facts. Not opinions or preferences. Facts. Perhaps read them and accept that they do demonstrate why, for each step a woman takes away from a physiological birth, the risks increase. You should read A Midwife's Tail by Ulrich which is a study of the diaries ifs midwife in the late1700s,and see her story as a window of how it was pre-industrialisation of childbirth. It's a fascinating book though a lot of it was lost on me as a non-American. Perhaps you could take thus article further to exploring how ultrasound examination doesn't improve outcomes either. Love your work!!!! @ Andygirl. You seem to have missed the poitnentirely. The point is that choices=good. However in most instances choosing medically unindicated ninterventions deviates from the normal healthy process and can have many unintended consequences on the baby. The point also goes further to illustrate how not only the mothers comfort of desires must be considered when choosing elective interventions. As you know the same is also true when a mom wants deny or refuse potentially life saving intervention. These choices must made with full information o pros and cons as well as the full autonomy of the mom without coercion derision or infantalizing the woman's choices. So andygirl I have just one question after you re-read this article whom do you think is being sanctimonious and perhaps a lot defensive? Hmmm?? I too am tired of walking on egg shells, and it is a very tricky edge. Good for you for taking it on! May I kiss your feet. The only thing I would add is the fact that as modern women, through no fault of our own, we are in the peculiar position of having been deeply imprinted by birth fear. Not just from movies and doctors pressure, but also from the way we ourselves were born, the way our mothers and their mothers were born. Women who choose interventions are, in a way, victims of the system they are seeking out... and perhaps the ones most marked by it. If we are to accept the evidence that the way we are born imprints us for our entire lives then we must also accept that modern women are host to a lineage and legacy of pain and fear written on our wombs, our throats, our breath, breasts, and being. Healing cultural trauma is an enormous task. In a very real way we cannot move forward alone. In fact, even though it may seem that some of us are "ahead" in the race, the truth is we rise and fall together. We are forging a path for the sisterhood of women. We must speak the truth about birth, and hold space for all women at the same time. Tnank you for an inspiring and compassionate act of courage. I will take heart and strength from it... and speak-up. Natural birth isn't about getting a gold star or bragging rights - it is about the health and safety of both mother and her baby. I wish people understand that more. I am praying for a day when natural birth is the norm in America, not the exception! We'll see a lot less trauma to mother (emotionally like PPD or physically like vaginal tearing) and we'll see much less trauma to baby (less premature infants in the NICU due to unnecessary induction or unnecessary cesarean). We will also see less DEATHS and that is the one I cannot stress enough. Of course I understand when a cesarean and induction are necessary and thank God for the technology and knowledge for those situations. I think we all get that and I know you get that Mama Birth. Thank you for speaking up about "the other side", the minority. Wow, great post! Also, Krista, loved what you said. May I borrow a few phrases? I'd love to give you credit if I could. Can you email me at msmonicam AT hotmail DOT com? Thanks! Yes. Seriously. Yes. Thank you for speaking out. We need to stop apologizing for simple facts. My only critique is a small one - please change "effect" where you have it meaning "to have influence on" to "affect". An effect = a situation; to affect = to influence, which is what you mean here. I totally agree! I have had two wonderful home births. I chose homebirth because that was the best choice for my BABY! I have long labors, and lets face it birth is painful. I would love to have had an epidural and to lay there sleeping through my labor. But that was not what was best for my child. When we have children we put them first, we do what is best for them. We would jump in front of a train for our child so why don't more women do what is best for their baby right from the beginning? So very true! Wish I would have been more educated the first time. I feel the exact same way about breastfeeding. It may be the mother's choice, but there is a best choice, and it does not just affect the mother! Huzzah! Good for you for dropping the PC act of "what is right for me may not be right for you." While breastfeeding may not seem the right choice for every parent, it is the best choice for every baby. Yes, we should all have options / choices available to us, but the truth is: some choices really are better than others! Oh, and what about the families that induce (or schedule surgery) so they can get their kid into the school year they want! That way they can be one of the bigger kids in their class - read: good for football! @andygirl you wrote "But posts like this are going to alienate a lot of women who could really benefit from some straightforward information that isn't so heavy-handed.".... It is this post that is full of straightforward information that adds me to the fans list. Just wondering but did you see how easy it was to follow the links to real facts that support this very real issue. I also did not see this post as damning all woman kind who has not had natural birth. It was opened and closed geared to a spacific person who just didn't see that their is a baby who is being affected by the mom's nonchalent birth choice. <3 Bravo Mama Birth! So can I ask you, do you believe these women are committing a moral wrong? Because that's what it sounds like. Although you admit that sometimes intervention is a good, so obviously a non-natural birth isn't in itself wrong. So what, the motives could be morally wrong? Of course, but that's probably a hard call to make in many cases. allows a woman to walk away from the birth with a positive attitude, it is a very good thing! If you think this is a moral issue, make that clear. If it's not a moral issue, then it really just comes down to the individual. In which case, we get it, you prefer natural births. And really, do you want to use the term "human right" for this issue? It already holds so little weight in the abortion discussion. Don't do it more damage by applying it to the right to have natural birth. I'm glad I chose a natural birth. Even though it was the worst pain ever and I felt like I was going to die, the minute it was over, I felt AMAZING. And my recovery was quicker for it. Women I know who have had the epidural were tired and in pain afterwards and had a lot slower of a recovery. Let's hope I can do it again when the time comes!! I definitely agree with you, and I wish I had the guts to say this to my friends/family who balk at natural childbirth and/or homebirth. I'm getting more people who support me than don't, but still... it's frustrating to explain to those who are against our choices (especially, since it's our first). Thank you for sharing your opinion! Opinions, however, are much like anuses. Everyone has one, everyone else's stinks. 50% of the population has an IQ below 100 and I commend you on your courage to be one of that 50% and step forward with such an astonishingly uneducated and selfish point of view. To be so blatantly wrong and yet share your misguided opinions as fact illustrates that what you lack in intelligence you make up for in conviction. I hope that you beat the genetic odds and breed a child with enough intelligence to survive, and thrive, despite their mother's feeble mental state. I'm concerned, however, that your offspring will languish. If you don't believe in advances in medicine you probably also don't believe in other advances, such as electricity, computers, the fact that the earth is round, etc. Odds are your child, if they survive despite your negligence, will end up an outcast and a reject. On the plus side, SOMEONE'S got to pump gas into my Mercedes. would you like to contribute some of your amazing intelligence to this discussion rather than just insults which honestly aren't even that witty? perhaps your might offer an argument, some "evidence," or even a thought-out perspective? otherwise, it's you who looks unintelligent and just plain MEAN! Krista, thank you for extending an invitation to me to share examples of my intelligence. I appreciate that you're looking for validation on my opinion and I respect your decision to question my credibility. I must decline. Being the most intelligent person in a room does nothing to contribute to my personal development. I also refuse trying to get your buy-in to my opinion as my opinion is simply my own. I would expect my opinion, as I stated previously, to stink to everyone but myself. What kind "evidence" do you seek? And why did you place the word "evidence" in quotation marks? The only hard fact I offered is that 50% of all people have an IQ below 100. This is, in fact, the very nature of the intelligence quotient. As to looking "mean?" I'm OK with that. I have no tolerance for those that would force their dogma on others and instruct them how to live, what is best, or what to do or not do. I'll go beyond "mean" and say that I'm an absolute jerk. The only thing that is a little frightening about this article is that it really doesn't talk about what goes wrong sometimes in natural birth. Because if your are not in a hospital you may not be able to save the child or the mother if something terrible happens. If i were to have a natural birth I would in a hospital without medicine but I would also have the safety net of the staff on standby if needed. Especially with my medical history it just wouldn't be safe for the child or me so I guess you could have a little bit of a choice if you wanted to go natural but are uneasy about giving birth at home. Your facts are right on. It's a shame that most women choose conscious ignorance and believe that birth is a medical emergency that requires powerful medications, while in pregnancy most women won't even eat a can of tuna to protect their babies. We know this is not true for low risk women and we know all the drugs get to the babies and give them a start in life no mother would choose if she truly understood it. It's ok if people need or choose interventions and I believe people come to birth from all kinds of places and sometimes people do need medical support for actual medical reasons, or maybe because they are afraid. Maybe they have the fear perpetuated in this country by the media and by other women (birth horror stories). But the fact is that most women who choose intervention/drugs aren't really giving fully informed consent. They don't know these things. And no one in the hospital is giving them all the facts. And unless it's a comprehensive class like Bradley, they aren't getting the truth from childbirth education either. Keep teaching, keep talking, keep supporting mothers no matter what, so we can all heal. It's the only way. As always, I am flattered that people read and took the time to comment. It is always a compliment when I can write something that inspires intense feedback, even when it is personally insulting. To Mr Grindle....I am not 100% sure what you are talking about but, while you are welcome to insult me, please do not do so to other readers. I realize that posting invites that, but it does not extend to others who comment. To Andygirl- the point of the blog is education- to some degree- but it is a personal blog where I can talk about things openly in a way that is comfortable for me, through writing. I love birth. I respect it. I find joy in it and I deeply desire that other women find this joy also. I enjoy writing and getting feedback and the forum that this amazing thing provides me. It is also however a place for me to express my thoughts and indeed FRUSTRATIONS with the way things are in obstetrics today. I never single out or even think of an individual when I write, so please don't take anything personally. It isn't meant that way. I am allowed to be frustrated and have opinions and even, yes, express them, in ways that others might find offensive. I find the state of obstetrics currently quite offensive, damaging and even detrimental to women and children. I see where you are coming from. I have expressed the same sentiments to other friends and bloggers and natural birth advocates (love the message but not your presentation) so I GET where your critique is coming from. But I am human. And I get ticked and this is a safe place for me to express that. People can take it or leave it. I am not making anybody read it. I think the tone of this particular post is a departure from how I usually present things, but I don't think it was out of line. Wow this is something new for me. Never seen something like this before. Thanks for sharing this with us and giving us all the knowledge. With my second child I was induced 5 weeks early because there was no more fluid. I was put on pit and had c section team ready incase I did not go into labor. I did have him with out being cut open. If I would of had him naturally I would of lost him. That means he would of died inside of me @ 35 weeks along. I can not think what that would of been like. It was hard enough to have him in the nicu for a week. I am very glad that the drugs were an option. You say natural birth is the only way. I say you need to concider what could of happene to me if I did not do what I did. How would you feel if you did not do everything in your prower to save your babies life? Love this article. I don't hear you saying anywhere that with a high risk baby who actually needs medical intervention, we should not have it. From what I'm reading, you're saying basically that most births are normal, do not need intervention, and do much better without, right? And I wholeheartedly agree and don't know how anyone else could deny the facts! It's better for Mom too. You may be trading "normal" labor pain that is good for you and baby for the pain associated with recovery from side effects of pitocin or epidurals or the many other medications made easily available and encouraged in the hospital, not to mention the third of women who spend the post-partum period recovering from a c-section. recovery from a vaginal birth without medication is generally much easier and faster (and less PPD), and you can enjoy those newborn baby days! Natural birth is better for Mom, too. By having a medicated birth, you are trading the normal pains of labor, which usually only last the duration of your labor, for the real possibility of side effects of labor medications you will have to deal with during the precious post-partum period. Not to mention if you are that third of women who end up with a c-section! An unmedicated vaginal delivery has a way shorter recovery period. This is a HUGE reason I am going "natural" and at home. My sis in law was BACK in the hospital a week later for kidney infection and fluid build up behind her stitches, which burst open. Another friend had a c-section for a "too big baby" that ended up being 7 lbs 6 oz. This is all in the last few months. No thank you! There are risks and benefits to both and one must understand that when making their decision to include medication or not in their birthing plan. My labor was 5 hours from start to finish, I had and epidural, smiled the whole way and then got up and walked about twenty minutes later. There were no problems with the baby, he was as alert as could be and I felt great. My pregnancies are horrible and I don't feel like I missed out on anything just because I didn't feel myself tear. The hospital here sees SO many of the babies from Midwife "clinics" coming into the hospital to spend time in the NICU, not to mention the babies that sadly don't make it due to home births. Most of the clinics here have no DR. around at all. Just because you didn't have your baby in a hospital doesn't make you better than the people that did. Get over yourself. Any REAL Doctor will tell you it's not very wise to have your baby at home. I have never seen so many ignorant people in my life. Kira Cook, I couldn't agree more! I love this ! When I told everyone that I was choosing to have a natural childbirth they all said - are u nuts !? BUT it was the best choice for both me and my daughter. Also, I saw in a documentary called "The Business of Being Born," I believe it was one of the second parts to this documentary, that there may be a real REASON for the birth process to take place. They have found this fact when looking at a vaginal delivery and a c section: When your baby passes through the birth canal, it is 'squeezed.' This helps expel the fluid that fills its lungs so that it may take that first breath of air that inflates its lungs for the first time when it's out of the womb. When a c section is performed and the baby is essentially 'lifted out' of the womb, this 'squeezing' process does not happen and the baby's lungs are still full of fluid and it is unable to take the first breath until it's suctioned out. Because of this occurrence, babies born by c section are more likely to have lung/breathing problems later on in life. So along with this I'm sure there are many other medical reasons that it's better for a baby to pass through the birth canal, whether medicated or unmedicated. You can't ignore facts like that. I understand your concerns with this blogs content but let's get serious. Women are strong incredible beings, and reading information like this is simply helping us to be well informed. Suger coating facts might make them a bit easier to take for some of us, but I think we're brave enough to handle it. I think its about making informed decisions. I'm 3 months pregnant and honestly nervous as hell about child birth so I'm enjoying getting some straight up facts about my options. It has been proven wothout doubt that fast food, processed food and junk food is bad for you. I am asuming that you read about all that and dont feed your child anything buy freshly prepared organic fruits, vegetables, meat etc. After all, someone like you who puts her child's needs first all that time and is not afraid to judge other women, cant be using processed food just because it is convenient for you some of the time. Coz that would make you a hypocrite. I dont usually post comments to this blog....and I know this article is a few years old. Yet this is my first preg. And I plan to birth natural. Mostly for many reasons stated in this article. I love the article, and the fact the the author doesn't hold back truth, or fail to provide the truth with facts. Now, IMO, all of you very defensive women on here, trying turn your nose up, is defensive for your own reasons. Its because you are truly trying to justify the fact that you willingly agreed to be caught by the myth of interventions. Dont sit up here and accuse her of judging, she is IMFORMING. Why are you even here ifyou dont support natural births, or her methods of it...last iI checked, it was HER BLOG! You are just a reader like the rest of us, so shut up and either support it, or dont. Smh. Stop being so mean to her!